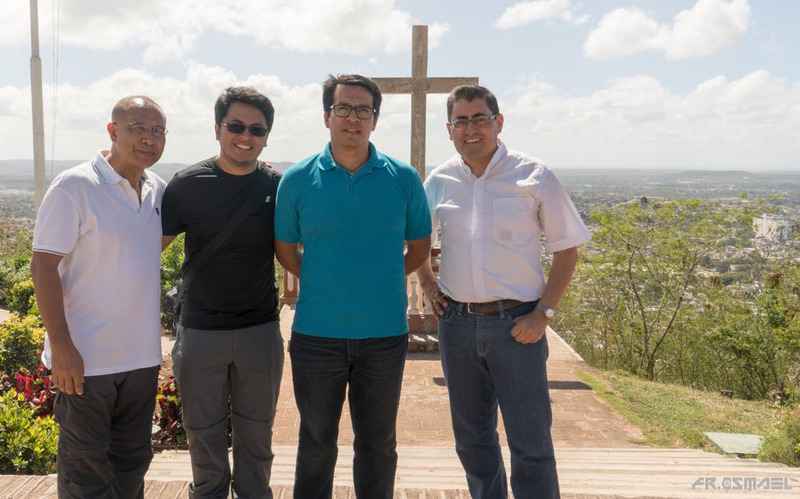 Since February 17, 2018, four Augustinian Recollects have founded a new community in Antilla (Holguin, Cuba) from where they serve the local parish and those of Tacajo and Baguanos. Integrating into a new culture and customs and dealing with the particularities of life on the Caribbean island has been their first task. The Augustinian Recollects arrived in Cuba on February 17, 2018, a Saturday. From a total of 32 volunteers, the General Council in Rome chose four friars to compose the international community: Fray Joel Naranja, Philippine, 54; Fray Jairo Gordillo, Colombian, 51; Fray Noe Servin, Mexican, 39; and Fray Ismael Xuruc, Guatemalan, 37. From Panama City, a direct flight leaves twice a week for Frank País International Airport in Holguin City in the Cuban province of Holguin which is one of the 11 provinces of this Caribbean island nation with a population of around 1.1 million. Emilio Aranguren, the bishop of the Diocese of Holguín resides in the eponymous city with approximately 350,000 inhabitants. Upon arrival after an hour and 45 minutes of flight from Tocumen International Airport in Panama City, the four Recollects learned the expressions often used in the island: “Have patience because everything in Cuba is slow,” “Let us go slow because we are in Cuba”. With three flights that arrived at that time, and with only one scanner for all passengers’ luggage, they were able to get out of the airport after three long hours. The morning heat was scorching. Bishop Aranguren was waiting for them outside with a microbus. From the airport, they proceeded to the bishop’s residence for lunch, and afterwards to their final destination: the Nuestra Señora del Carmen Parish, in the town of Antilla facing the Nipe Bay, some 80 kilometers from Holguin City. A warm welcome awaited the friars in their convent in Antilla. The 32-year old outgoing parish priest led the other lay people who represented the different parish organizations in welcoming the missionaries. Snacks was served afterwards. 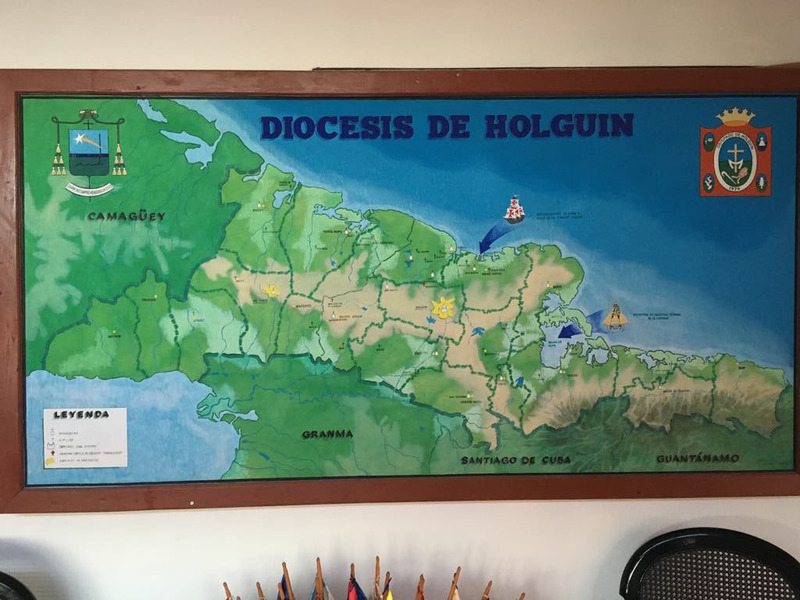 The pastoral work in the Diocese of Holguín is attended to by 12 diocesan priests, 6 diocesan priests “ad gentes,” 13 religious men from different institutes (SVD, Little Brothers of Jesus, OSA, and OAR) of whom 11 are priests, 4 permanent deacons, 50 religious women from 17 congregations, and 3 members of a secular institute. Of the 60 houses of worship, 24 are parish churches. The four Recoletos friars take charge of three parishes, with the housing center in Antilla, and the other two parishes in Baguanos and Tacajó, some 50 and 30 kilometers from the convent, respectively. Antilla is a port town by the bay of Nipe with 13,000 people. Its newly constructed church can accommodate around 180 persons. The parish of Tacajó has around 15,000 residents while the parish of Baguanos has approximately 19,000. The friars have to minister also to other small communities where a holy mass has never been celebrated. According to Fray Jairo, Cuba is a country that remained confined to 1959. The buildings and vehicles are very old, antiquated, and with less or no maintenance. “The misery of an impoverished country could be seen, as Father General has warned us, repeating the words of the bishop, that instead of being able to overcome it, people are slowly becoming poorer,” he said. For transportation, trucks with a modified bodywork are used. 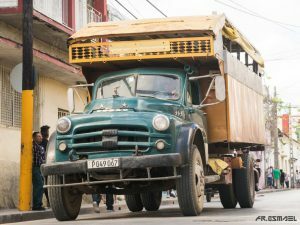 Buses called “guaguas” often carry tourists or persons like hoteliers who work in far-flung areas. Other means of transportation include carts drawn by horses which can carry 8 to 10 passengers, motorcycle taxis, and pedicabs or bike taxis. Basic diet consists of rice with black beans, sweet potato, pork, chicken or sausages. Beef is prohibited; only small children or sick people with medical prescription can eat it. Milk is only for children below seven years old. Vegetables and fruits are very scarce, and when they are available, they are so expensive. People obtain many goods by smuggling or or from the black market, but for a much higher price. Salaries and wages are very low. The medium salary is pegged at 30$USA monthly. 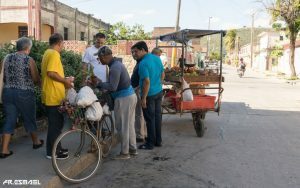 Moreover, the government distributes to its citizens the Supplies Booklet which establishes ration to each person per month: 7 lbs of rice, 1 lb of white sugar, 1 lb of brown sugar, 4 oz of coffee, 5 eggs, 0.5 lb of oil, 11 oz of black beans, 1 lb of chicken, etc. While these basic commodities cost 18 Cuban pesos, or less than a dollar, the serious thing is that the mini-market lasts only for a week. What will they do then in order to survive for the remaining days of the month? To this question comes the response: Cubans live and depend on three possible sources: the supplies booklet, remittances sent by relatives living and working abroad, or theft. This last is equivalent to robbing the State since all companies, factories and big businesses are owned by the government. If you are a baker, for example, you steal some flour in order to sell it in the black market; if you are a butcher, you steal a little and sell it. Everybody knows about this pilferage but people remain silent, waiting for their turn to do the same in order to be able to survive. He also related having talked to a doctor in Havana, an internist with a monthly salary of $50, which is $10 more because he is a specialist. He works eight hours daily, from Monday through Saturday, but his salary does not suffice. To augment his income, he works overtime as a taxi driver, and says that he gains more as a taxi driver than as a doctor. But he needs to work in the hospital because of a contract already established by the government. People in Cuba have managed to get a little ahead with their private business ventures or street selling. Everyday people pass by the façade of the convent buying and selling bread, banana, garlic, homemade ice cream, pork, tomatoes, homemade sweets, etc. What do they often say when you greet them in the street or when you ask them how they are, is: “There we go, Father, surviving, in the everyday struggle”. Another matter that costs a lot is the lack of communication. This is very much controlled by the government. Etecsa is the only, and state-owned, telephone company in Cuba. The internet with wifi connection is in public premises, usually in the plazas or parks where signal is quite strong. Surfing or browsing is very slow. Some private individuals, however, may have access to the internet but with permission controlled by the government. The bishop’s residence in Holguin, for instance, has a wifi connection which the friars take advantage of when they happen to be there for pastoral matters or drop by for food purchases. Although all parishes have a telephone, the Recollect convent there doesn’t have one. They have mobile phones but the signal is poor. There is a TV set in the convent that displays some channels but they, too, are controlled by the government.